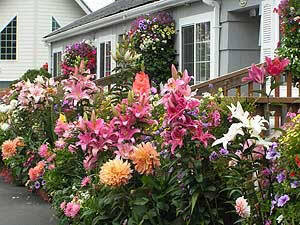 (Oregon Coast) - They inspire imaginations, impart mystery and create an ever-widening array of emotions and thoughts. And many of them may or may not be haunted. Four of the five lighthouses on the upper half of Oregon’s coast are some of the most legendary. 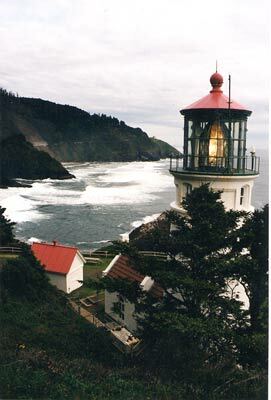 Indeed, one – the Heceta Head Lighthouse, near Florence – is the most photographed lighthouse in the world. 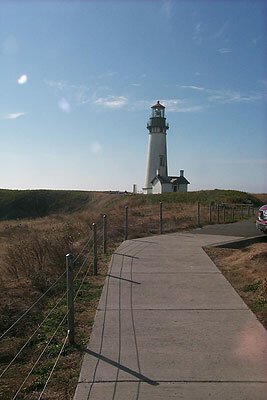 The others are the Yaquina Bay Lighthouse and the Yaquina Head Lighthouse in Newport, the lighthouse atop Cape Lookout (near Tillamook), and the Tillamook Rock Lighthouse, a mile offshore from Seaside and Cannon Beach. All but Cape Lookout’s light have some weird tales surrounding them, in various incarnations. And these tales intertwine tightly with the buildings’ histories, making for some lively discussions and research. There are upcoming TV shows, talks on coastal ghosts and a DVD being released soon which cover this subject as well. This is one lighthouse that has never been accessible to the public and probably never will be. Thus, it sparks the imagination more than most, with mysterious silhouette lying more than a mile away. Indeed, the truth behind this lighthouse is weirder than fiction itself – or any of its ghost tales, for that matter. It began in the 1880’s, when it was decided that too many ships were meeting their demise at Tillamook Head and this part of the north coast. 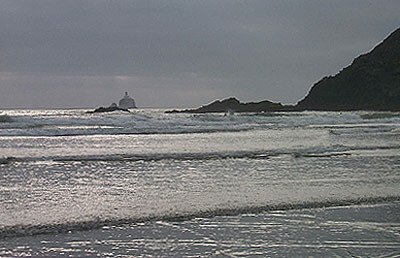 It was eventually planned for the blob of basalt rock offshore rather than Tillamook Head itself, as fog or other blind spots on the headland would create visibility problems. Things didn’t start well. The first man to step on the rock to do some surveying drowned, creating an immediate public outcry that perhaps this wasn’t a good idea. It took a lot of blasting to flatten the top of the rock enough to build the lighthouse. Then, construction crews had to endure insane conditions, living under soggy tents and enormous waves that constantly knocked at them. The crews lived in rotating shifts on the rock, and there were so many casualties in these conditions that men waiting onshore to work there were actually sequestered away from the public and from talk of what went on there. They were housed in a remote spot on the southern Washington coast and later on a ship just offshore. Lightkeepers lived there in shifts too: four of them, usually a few months at a time. It was a brutal existence, and one keeper reportedly went mad from the solitude. A giant winch was used to bring supplies and personnel from visiting ships to the rock, which was a dangerous and unwieldy endeavor under even the best conditions. They were put inside an object called a breeches buoy – which is essentially a giant pair of pants encircled by a floatation ring, attached to the cables overheard. Numerous men were lost doing this. The place was ripe for ghost stories. It didn’t help that local tribes purportedly said it was inhabited by evil spirits. There are rumors of ghost tales over the years, including the claims of voices heard over the din of storms from lens area and other dark parts of the lighthouse. Sometimes, stories about ghost ships appearing in the fog and drifting past are associated with the place as well, but usually these have foundations in actual events involving near misses from real ships. Indeed, a ship called the Lupatia nearly hit the lighthouse in dense fog, but was warned away just in time. However, it did soon after slam into Tillamook Head, killing all aboard except the ship’s dog. 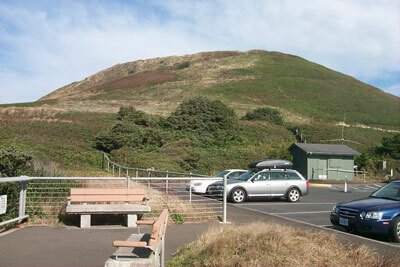 One legend says that you can sometimes still hear the dog howl in the night near Tillamook Head. Another almost spooky tale from the lighthouse comes from a keeper who felt something brush past his face in the dark while lying in bed. All of a sudden, he heard strange footsteps in the pitch black, and after a time, bolted towards the light switch, arms swinging wildly in an attempt to smack whatever being – or trespasser – was there. When he turned on the light, he found only an injured bird that had somehow made its way into his bedroom. The odd footsteps were its broken wing hitting the floor. In the 80’s, after numerous failed ownerships, a firm called Eternity at Sea bought the property, and it now serves as a columbarium – a place for ashes of the dead. Rather comically, that firm ran ads in the early 90’s or so offering free satellite TV for life – if you reserved your resting place early. Presumably, they figured if you were making such arrangements you wouldn’t be around too long. 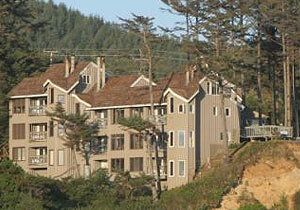 A bevy of rumors and ghost stories have surrounded this beauty, the tallest on the Oregon coast. But none are as wild as the truth behind the place. The big tale involves a lighthouse keeper named Higgins who supposedly got drunk, then fell and broke his neck on the spiral staircase. Another version has the man deathly ill, and forced to work on the lens until he passed out and died, because of the negligence of a co-worker who didn’t attend to his duties. In any case, Higgins purportedly haunted the place thereafter, and his old coworker refused to go near the staircase at night for fear of running into the ectoplasmic Higgins. Another story claims a construction worker fell to his death in between the layers of a wall while the building was being built. His corpse could not be retrieved, so the building was supposedly finished with his body still inside. Those stories were eventually ghost-busted. 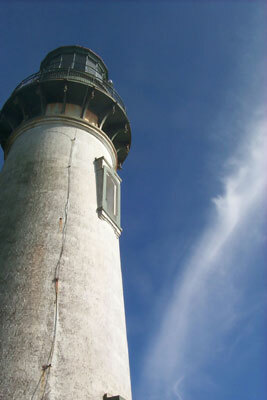 The Bureau of Land Management, which now runs the lighthouse, told BeachConnection.net they received a letter from a descendant of Mr. Higgins who said he did not die in the lighthouse. He moved to Portland, became a dockworker, and eventually died of natural causes there in the 30’s. A true scary story, however, is how the Hollywood crew from the old “Hardy Boys” TV show came to the lighthouse in the 70’s to film a Halloween episode, complete with lots of cobwebs and other spooky accoutrements scattered around the lighthouse. The group in charge of the lighthouse at the time had to sue the Hollywood crew to come and clean things up. There actually is a cemetery in the hills atop the headland, set a ways behind the trails atop Salaal Hill and the old quarry. There is also a tale of a head lighthouse keeper who died in a storm while trying to cross a creek close to the ocean, getting washed in by a large wave. The story has his daughter so bereaved she shot herself. It’s said sometimes you see her spirit wandering the beaches between Agate Beach and Nye Beach, looking for dear old Dad. 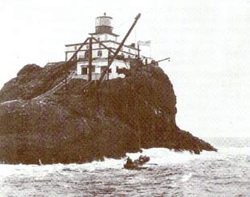 Another rumor about the lighthouse says it was mistakenly built here instead of at Cape Foulweather, just to the north and much taller. This is not true, say historians. Newport is lucky to be blessed with actually two lighthouses: one at the headland, and this smaller one, which serves as a bit of living history now. It was started in the late 1800’s, but was shut down after only three years. The place started to decay fairly quickly, and really fell into serious, even creepy, disrepair by the early part of the century. Somewhere in there, a tale got started about the ghost of a teenaged girl named Muriel, who had fallen to her death while being chased by pirates, or something like that. One version involves a secret passageway into a hidden cavern beneath the lighthouse, where she fell. This tale has her wandering the beaches as well, appearing out of the fog. However, it turns out this one was only a fictional short story written by an imaginative local around the turn of the century. What is interesting to note, however, is that until local historians found the original short story in the 80’s, it had somehow weaved itself into local lore as a real ghost story. Even book authors took the tale seriously as late as the 70’s. The lighthouse here is one of the only ones on the coast to still have its keeper’s quarters. They’ve been turned into a charming little B&B, in fact, and it’s on the national historic registry. It’s notorious for being haunted, however. 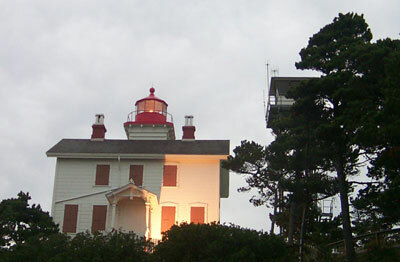 Indeed, Coastal Living Magazine recently named it one of the top ten haunted lighthouses in the nation. It’s said to be inhabited by someone nicknamed the “Gray Lady,” or “Rue,” often appearing as either an elderly woman or a grayish, smoke-like figure of a woman that quickly dissipates. One version of the tale is that she is the mother of a baby whose grave sits hidden somewhere on the grounds. The other says she is the person in this secret grave. 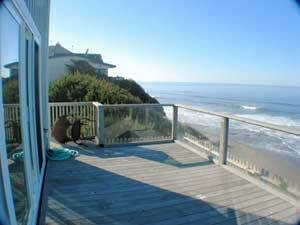 In any case, this one has more witnesses and coherency than any other ghost story on the coast. The family that runs the B&B claims she’s just a member of the family now. Some of the earliest tales involve workmen who’ve encountered the otherworldly lady and ran off in fear. One man actually refused to finish working inside one room, and would only continue working on a window from the outside – even after he broke it. He wouldn’t even venture in to clean it up. In the middle of the night, the family living there heard sweeping noises somewhere upstairs. The next day, they discovered the mess had been swept into a neat little pile. Two of the more credible witnesses of this ghost are famed Oregon scenic photographers Steve Terrill and Larry Geddis. Terrill spoke to BeachConnection.net editor Andre’ Hagestedt in 2001 and told him how the pair were staying at the B&B while shooting photos of the area. At one point, they spotted what looked like the figure of a woman in the window of Geddis’ room, if only briefly. When they later discovered there was absolutely no one in the building at the time, Terrill said Geddis was visibly disturbed. Later, Terrill said, they discovered some small objects in Geddis’ room had been moved. The Oregon Coast Show (Channel 22, KPXG), will spotlight these haunted tales the following two Thursdays – Nov. 2 and Nov. 16 – at 7:30 p.m. on channel 22, or on Comcast cable ch. 5. It will also air Thursdays and Fridays on Nov. 2 - 3, and Nov. 16 – 17, in Tillamook County and Lincoln County, on Charter cable ch. 18. The episodes are partially footage from Oregon Coast Show producer Scott Gibson’s DVD “Oregon Lights,” which will be released soon for purchase. 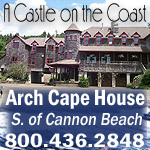 Other parts of the Oregon Coast Show segments on haunted lighthouses come from BeachConnection.net editor Andre’ Hagestedt, who acts as the on-air reporter, transitioning sections of the show segments and sharing his own knowledge about the subject. Hagestedt will give two talks this coming weekend on paranormal tales and ghost stories of the coast: at Newport’s Oregon Coast Aquarium on Saturday, October 28, and in Seaside, at Beach Books, on October 30. Click here for more.